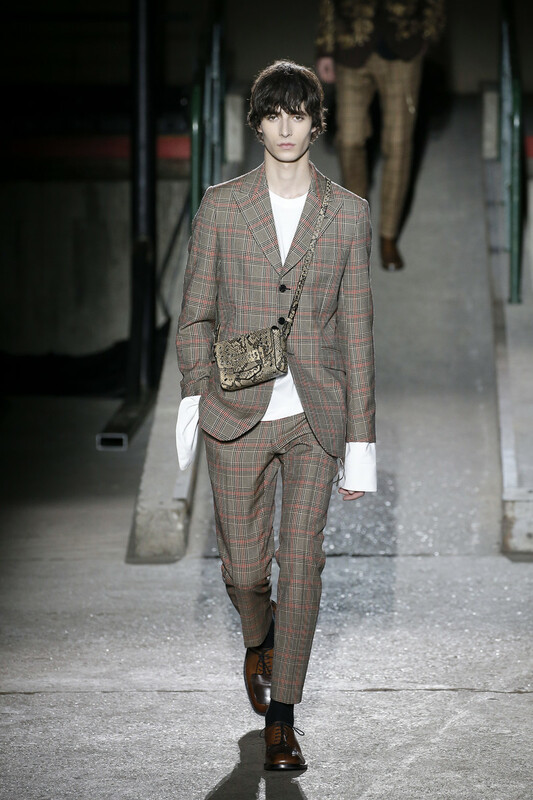 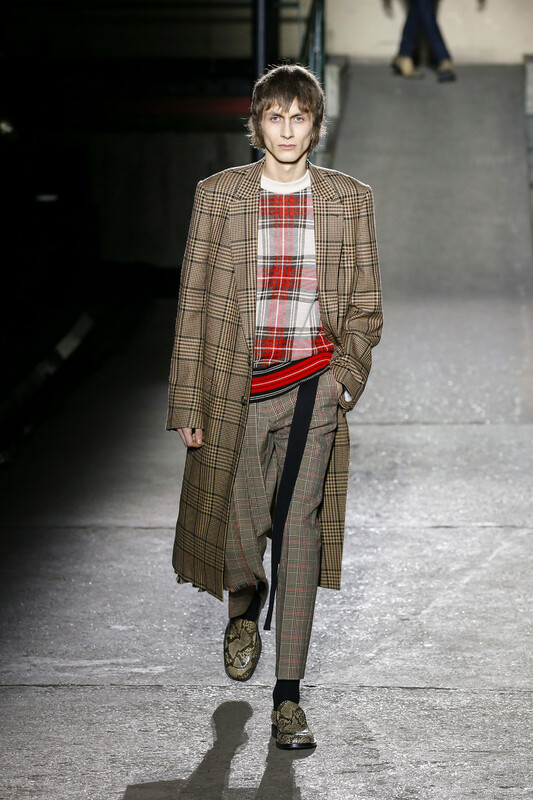 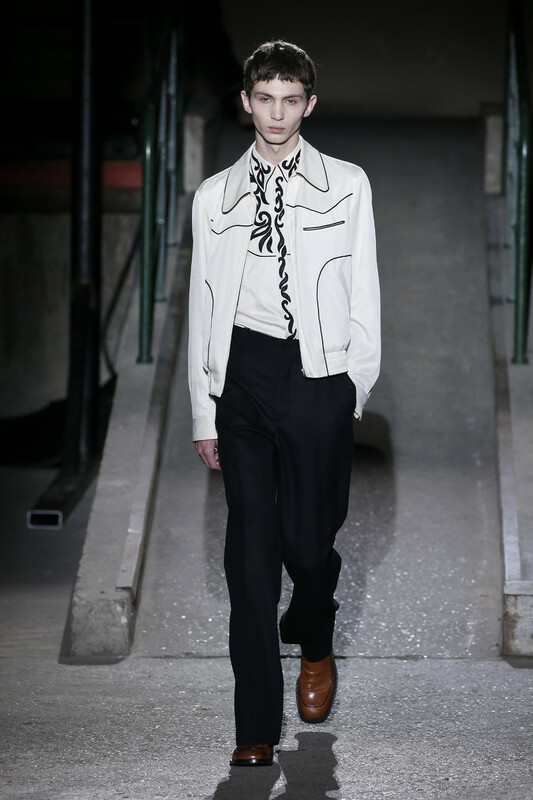 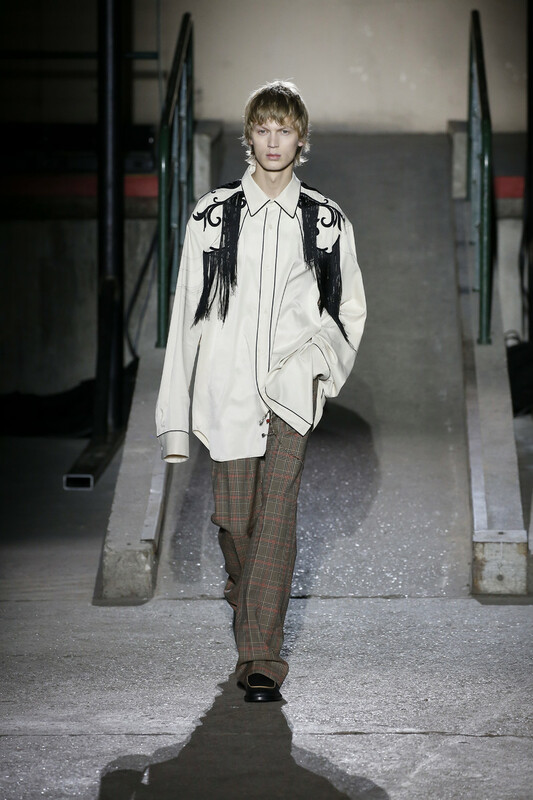 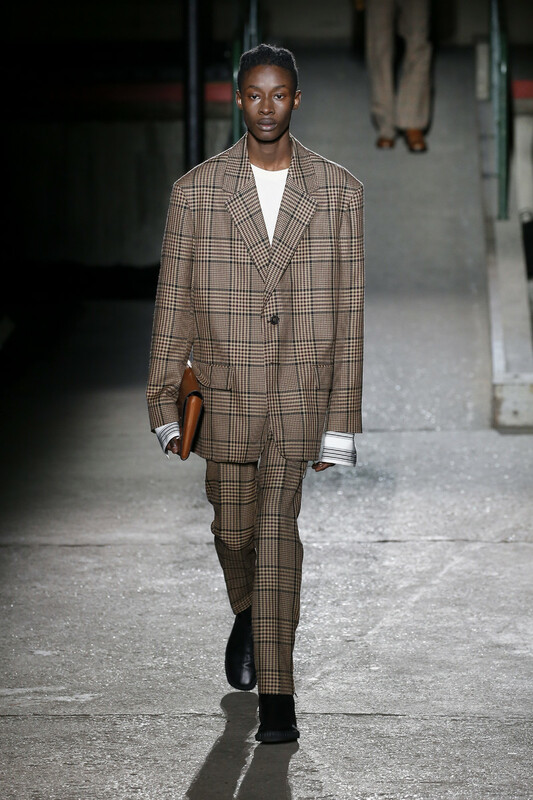 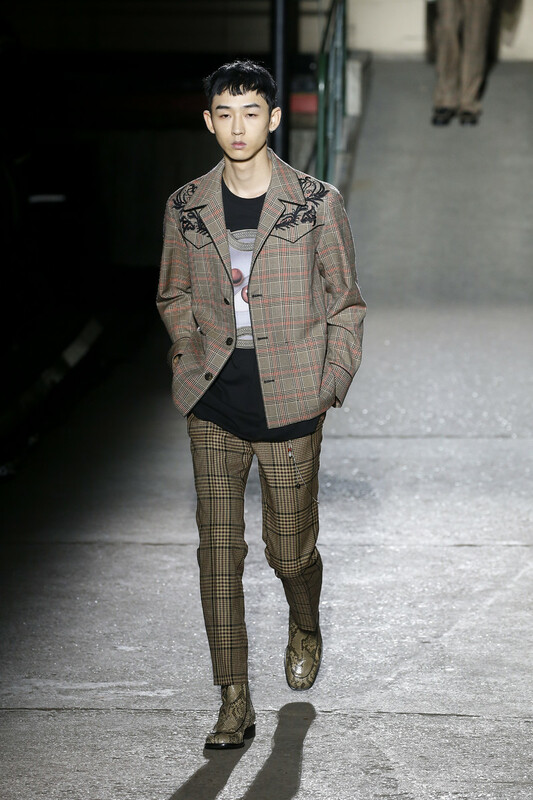 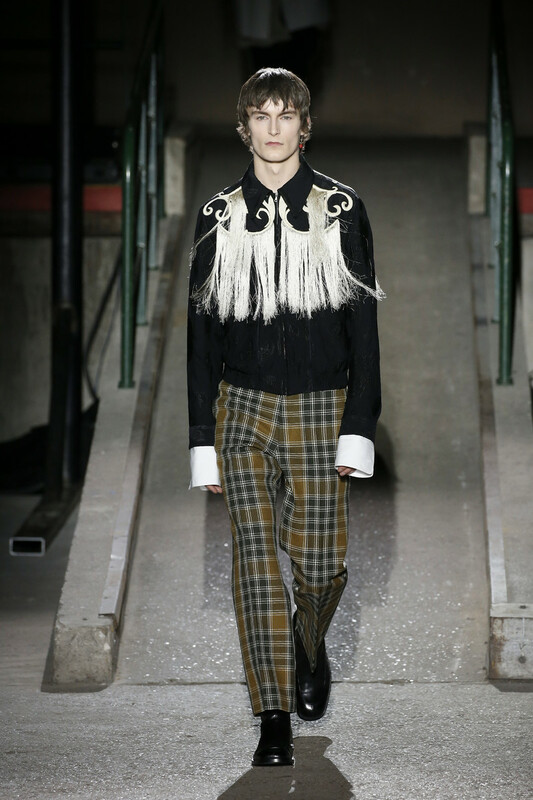 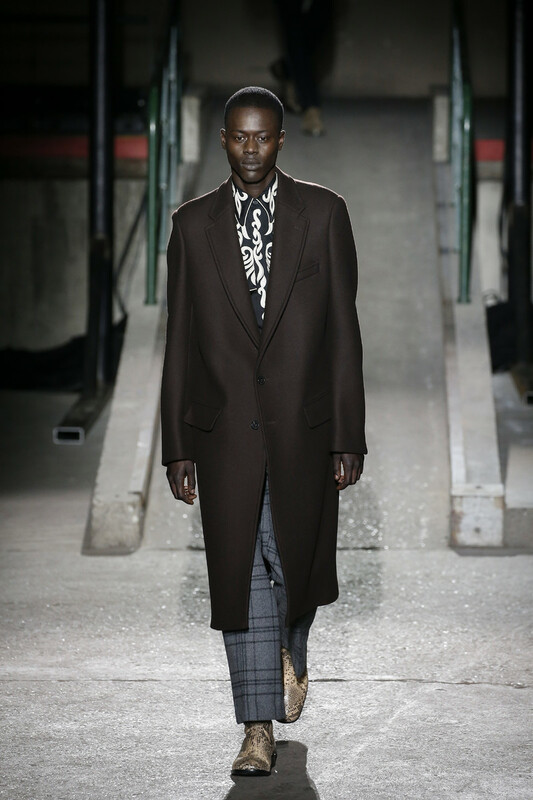 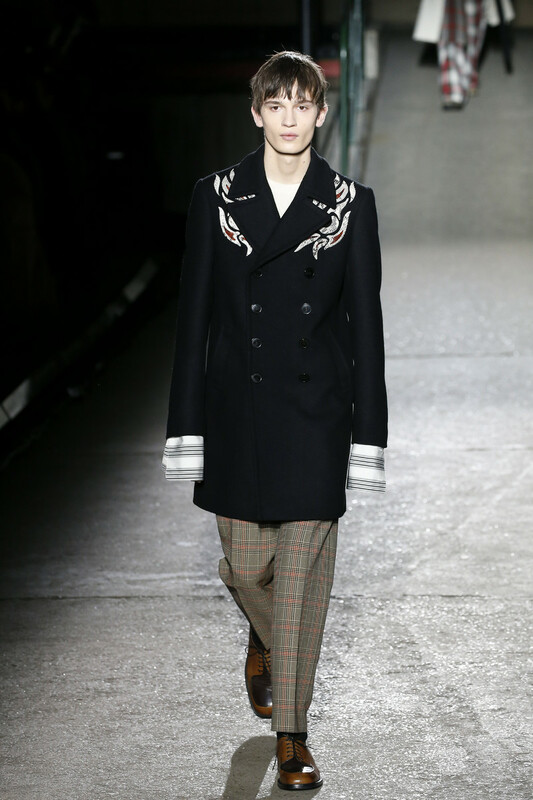 Dries van Noten presented a curious, but well balanced mix of combinations, like Las Vegas-style Western garb, white broderie anglaise pants, military parkas, suits in traditional British checks, granny crochet cardigans and pajama stripes. 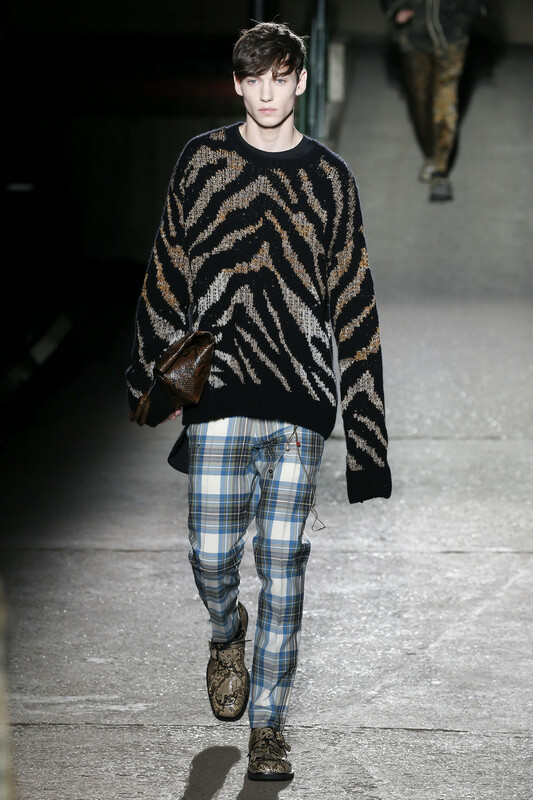 There was also a hint of pimp and a hearty dose of punk, such as a look pairing a glittery zebra sweater with tartan pants. 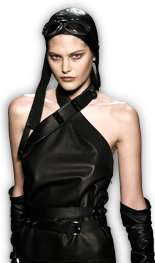 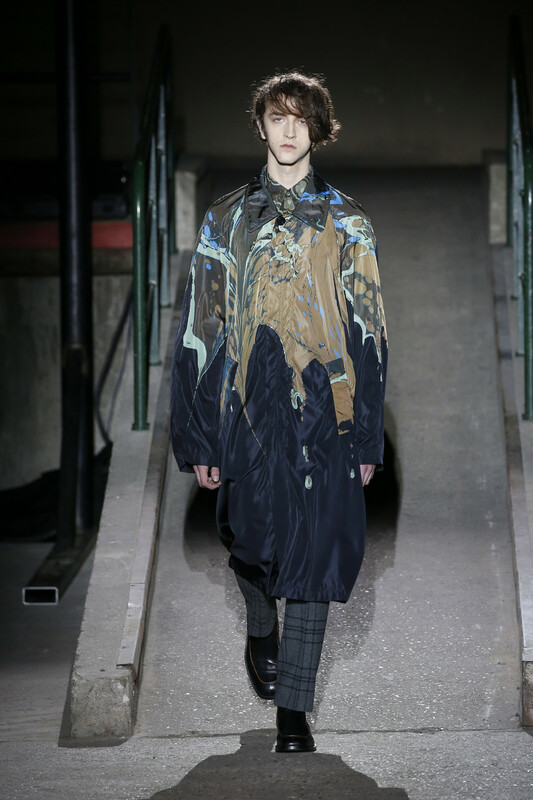 Even the more daring elements were digested perfectly into the looks. 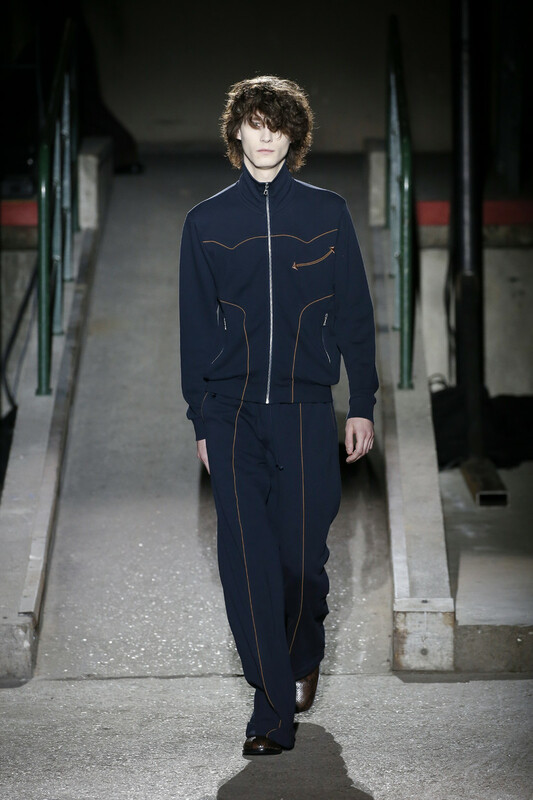 Case in point: a minimalist navy tracksuit traced with lines of tan cowboy-shirt piping. 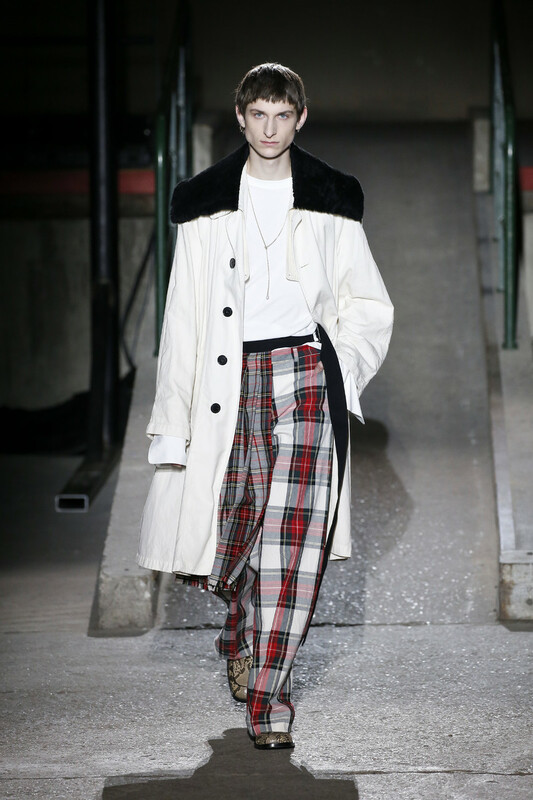 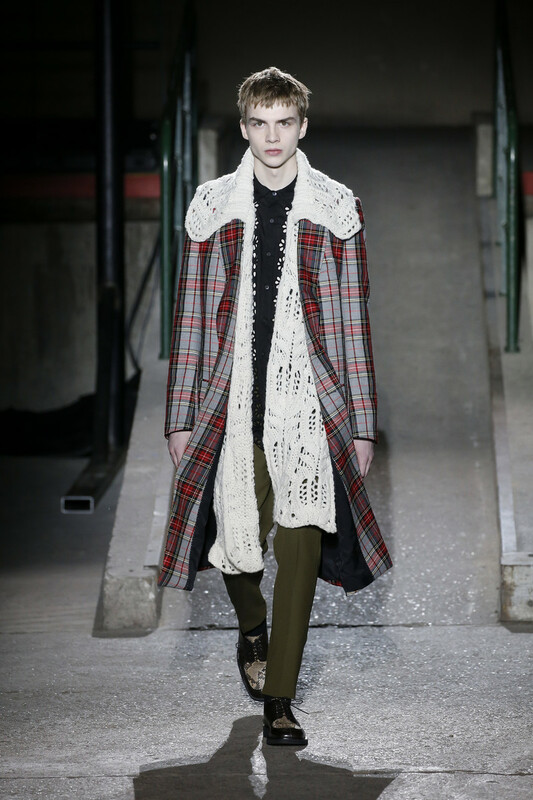 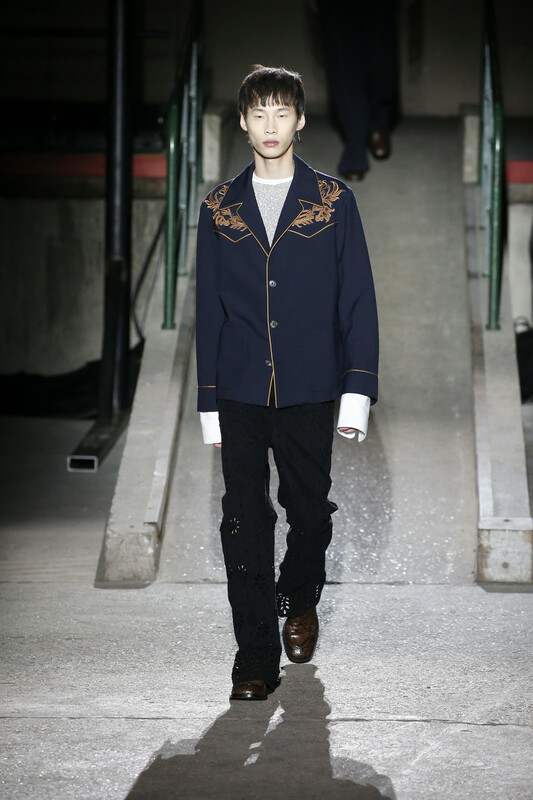 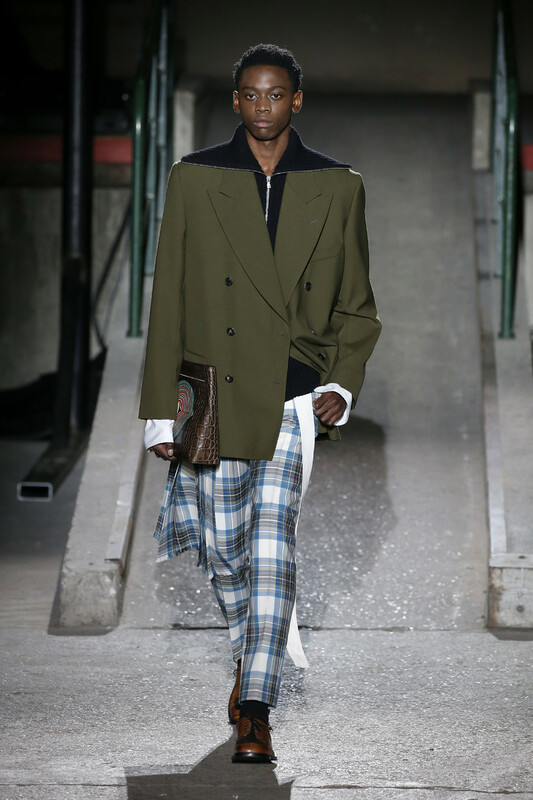 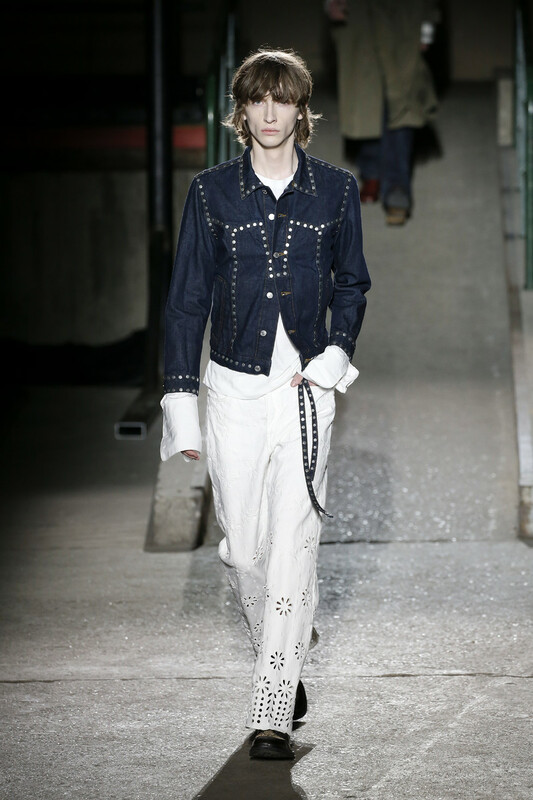 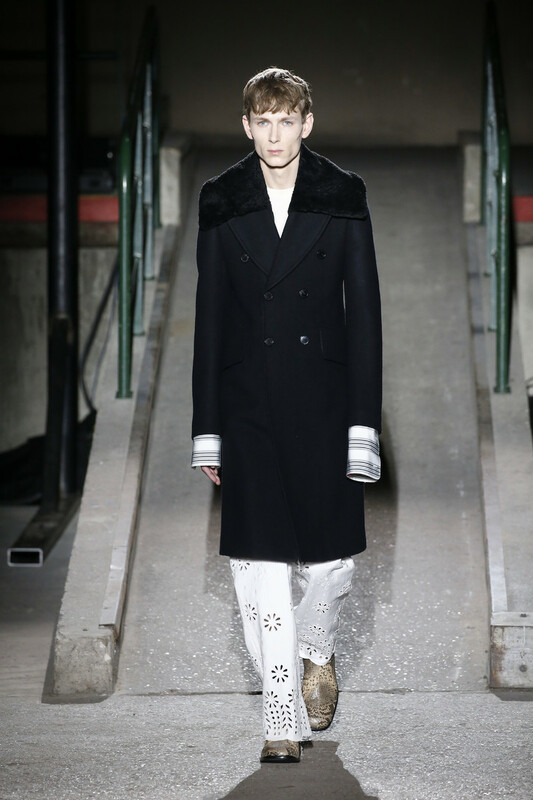 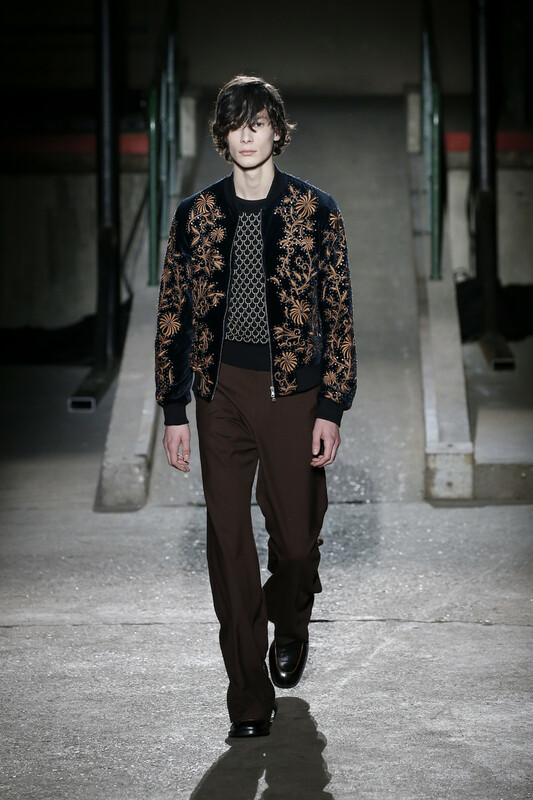 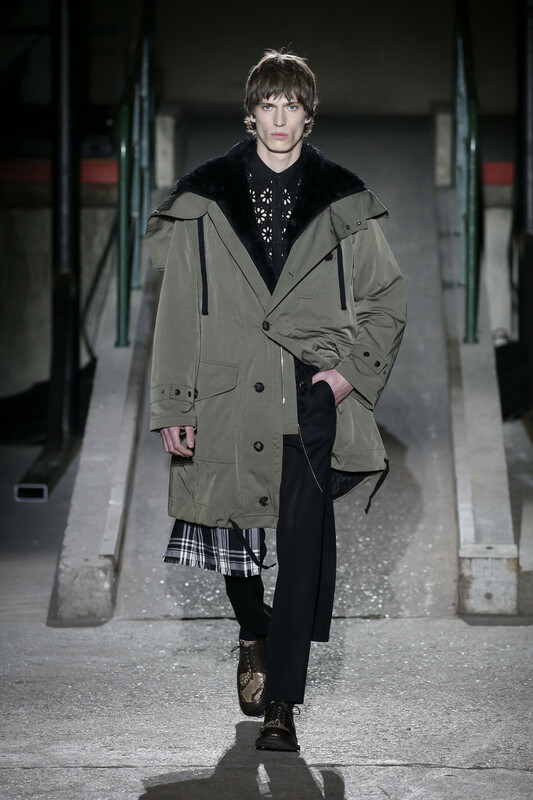 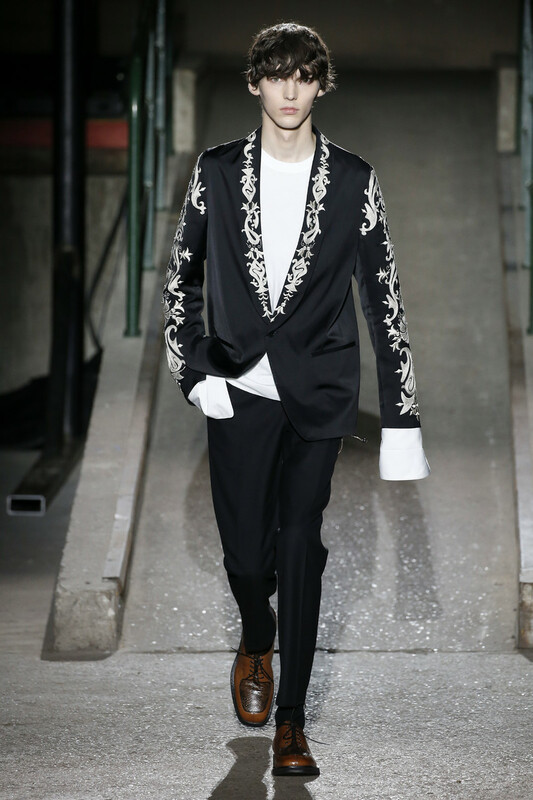 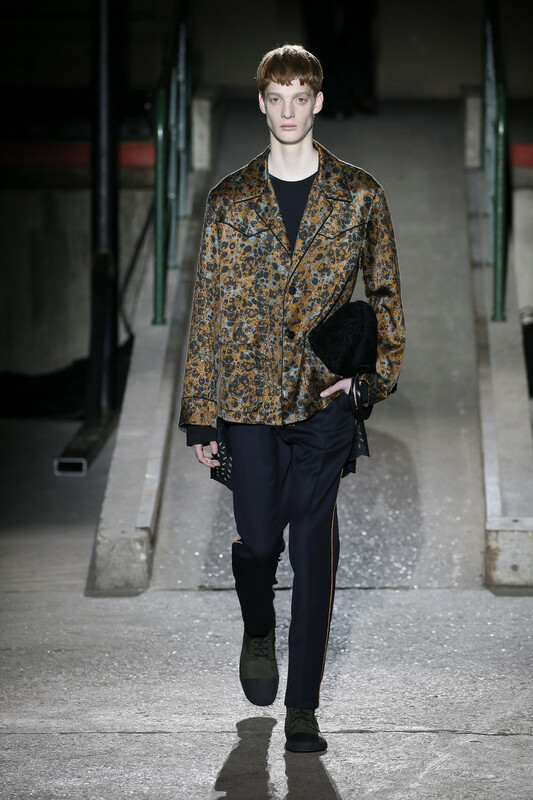 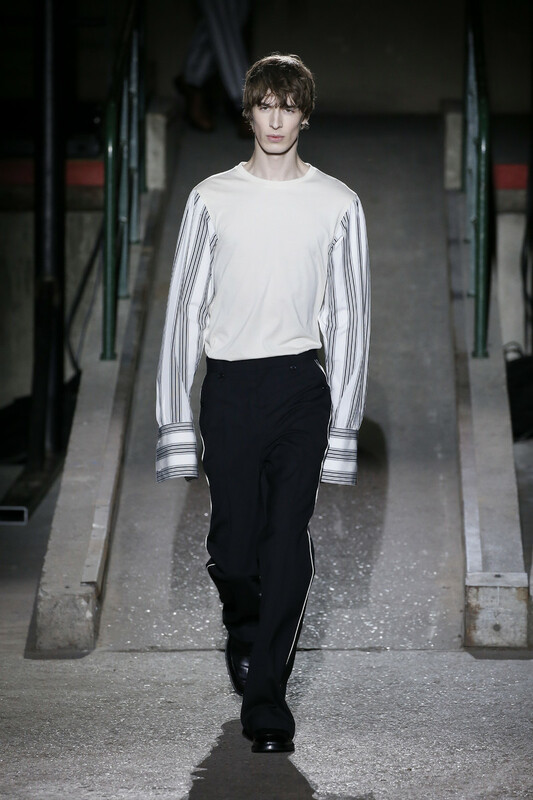 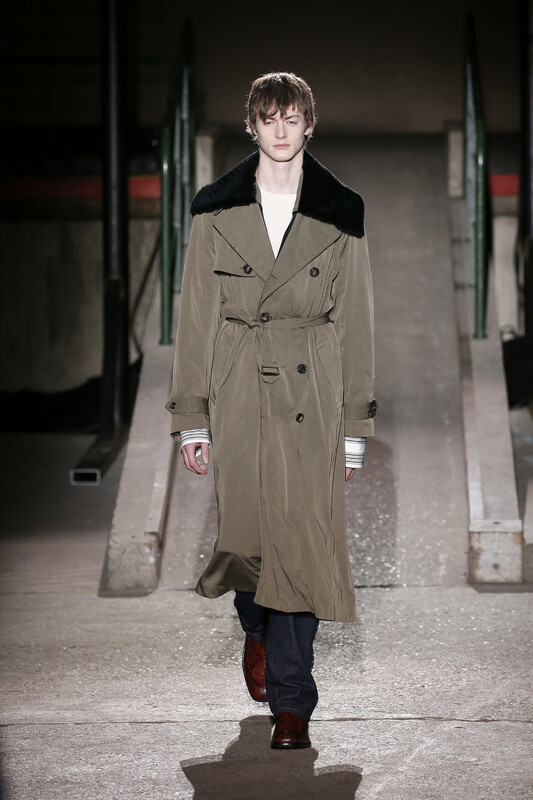 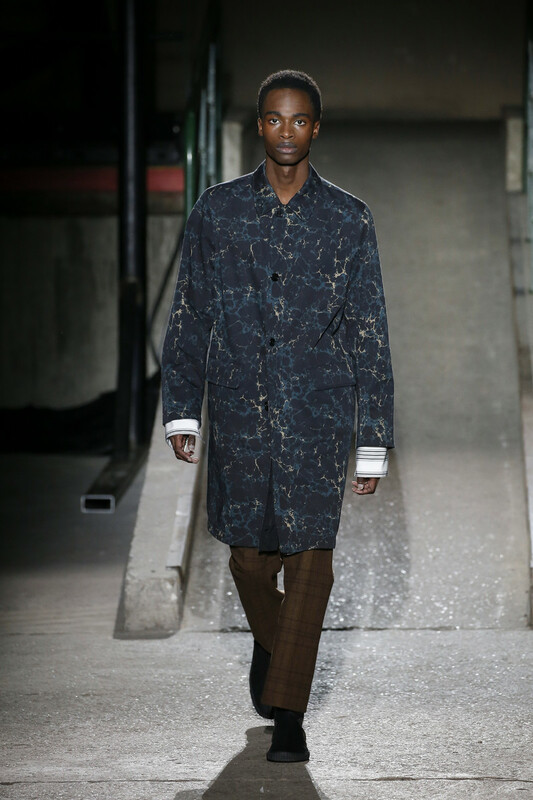 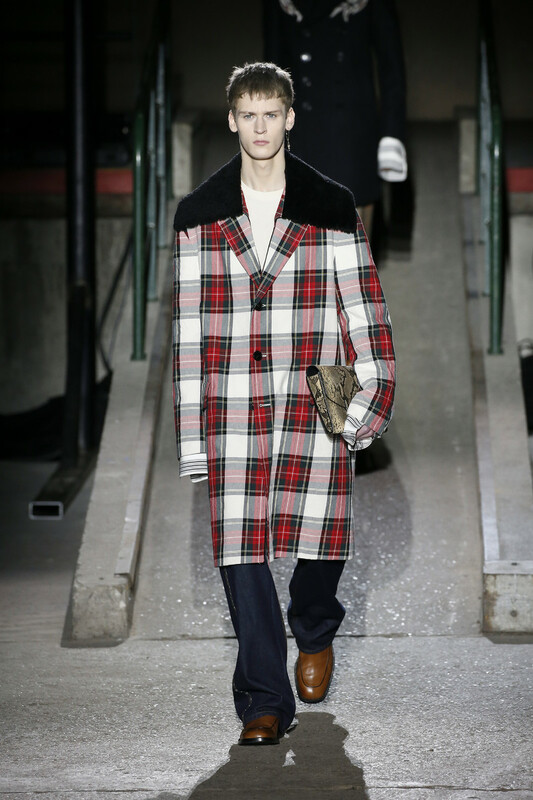 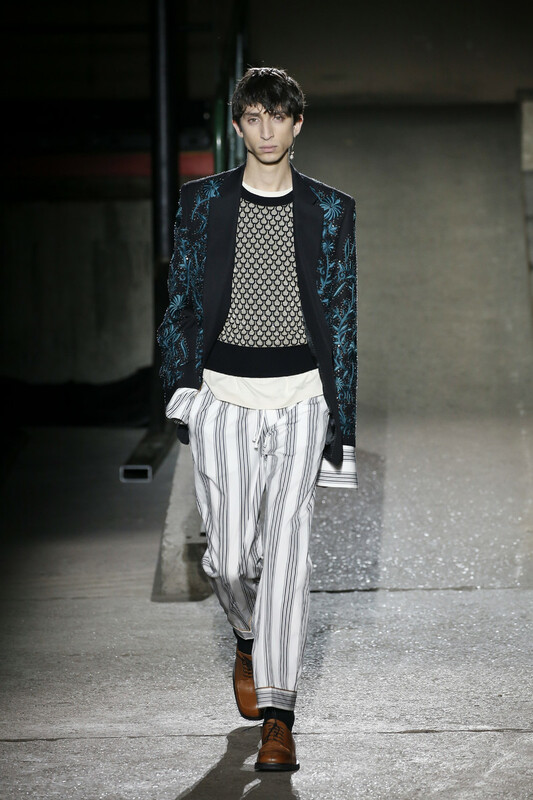 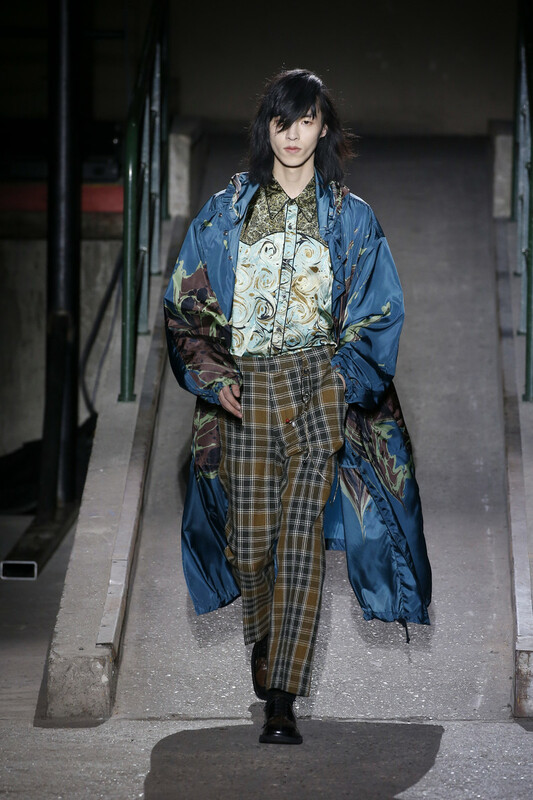 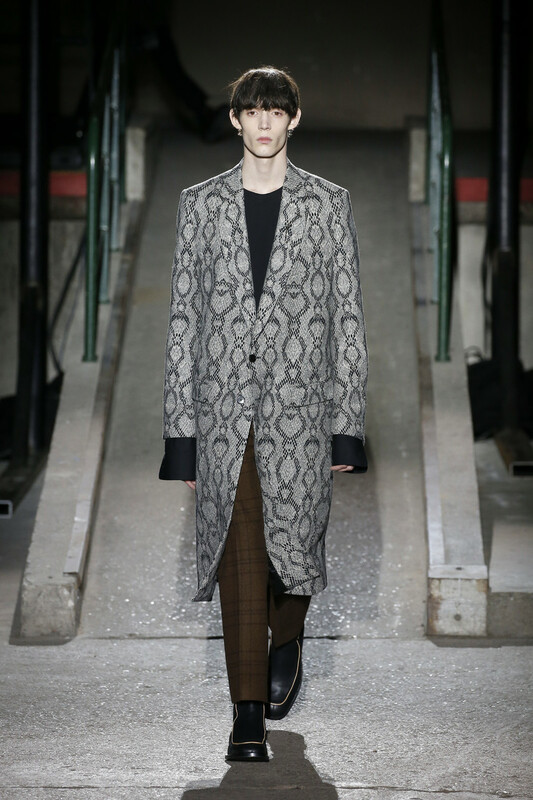 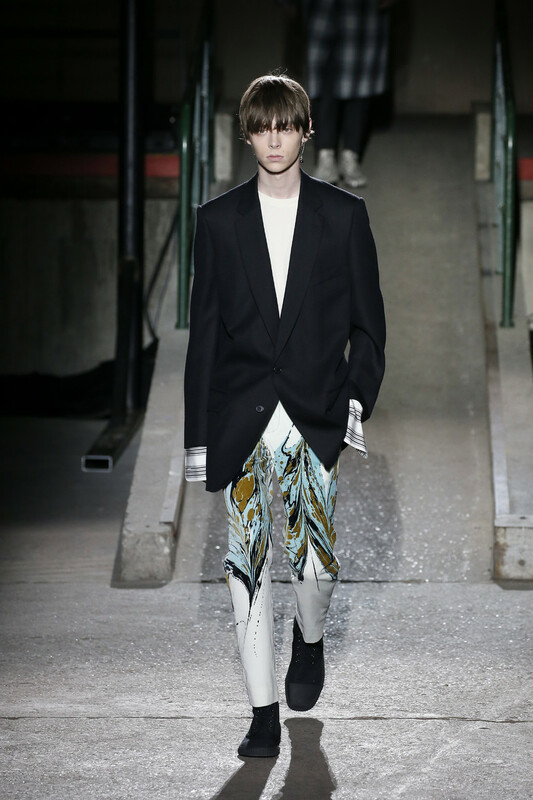 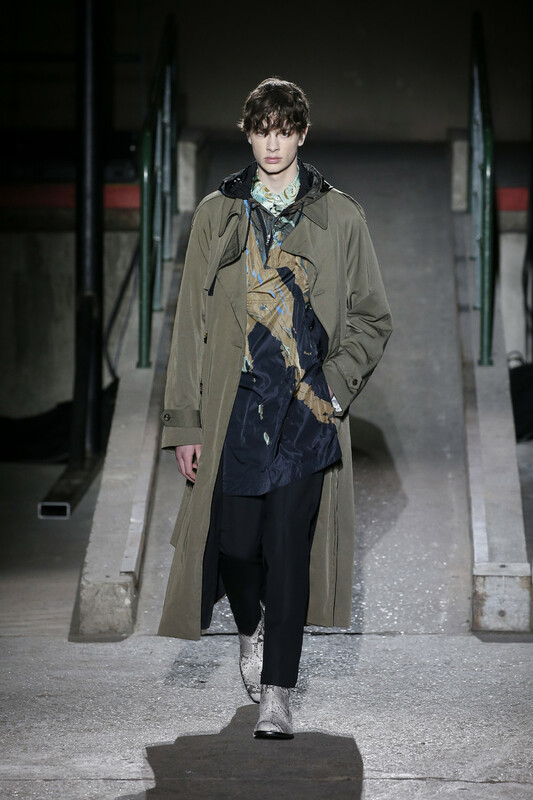 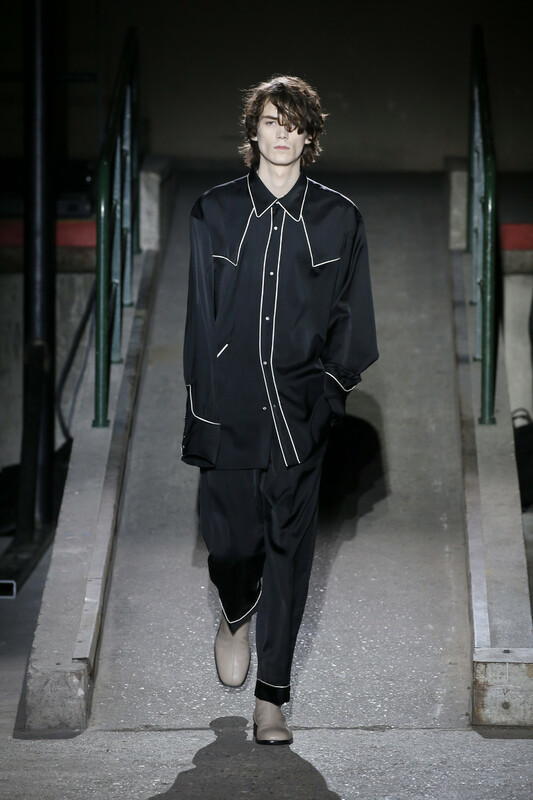 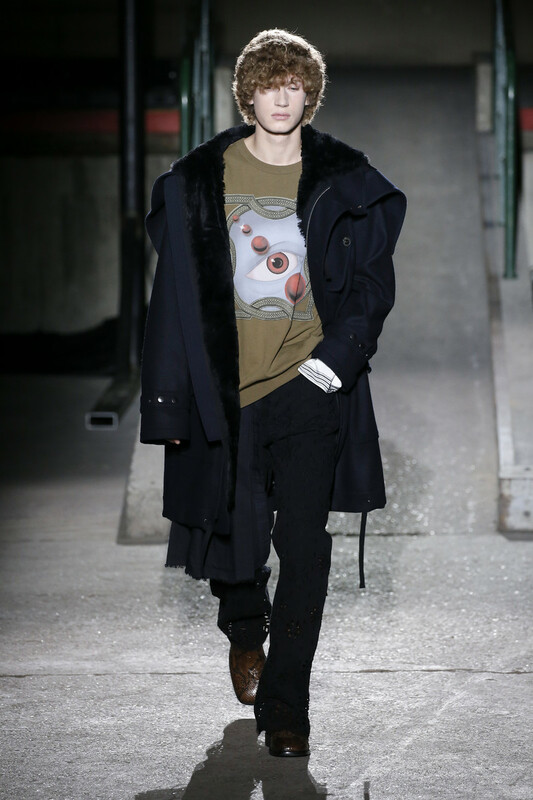 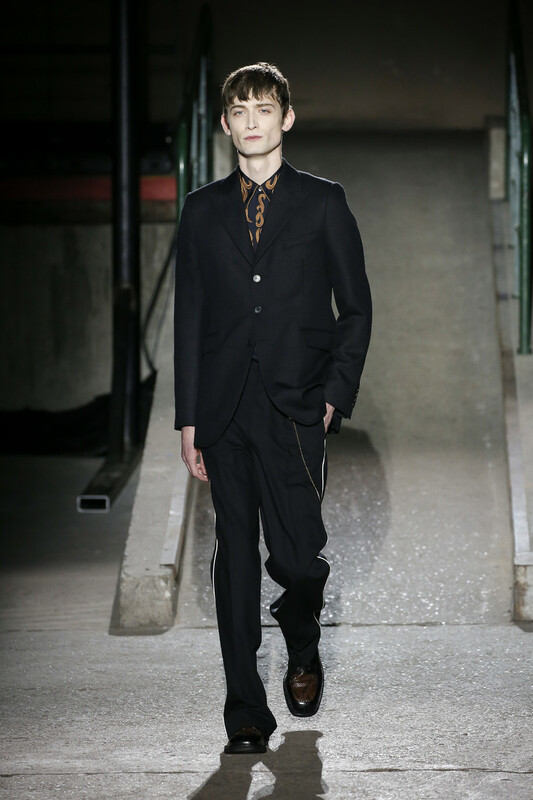 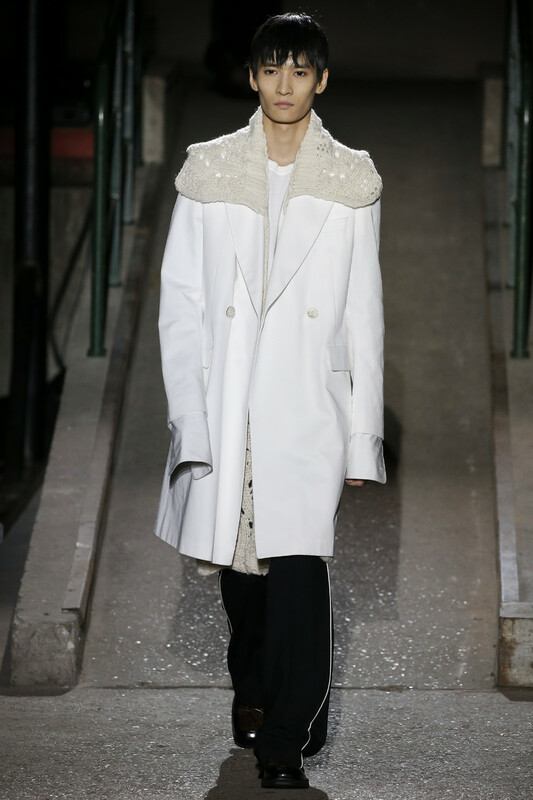 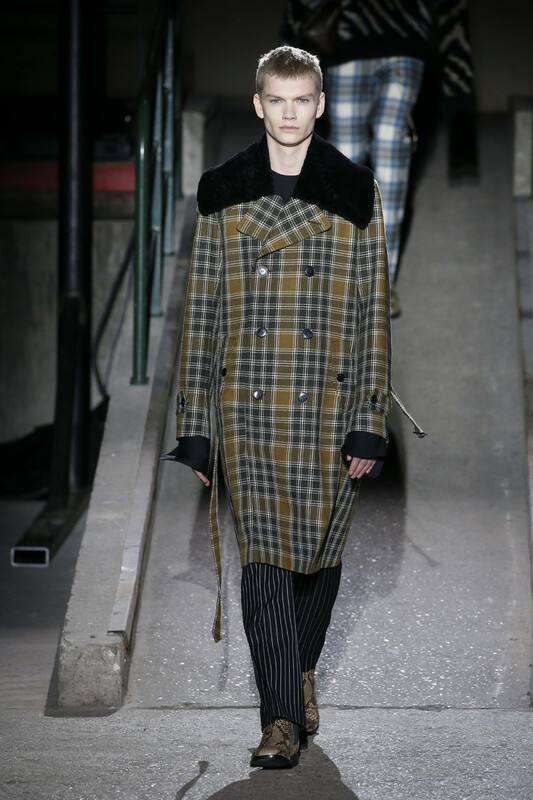 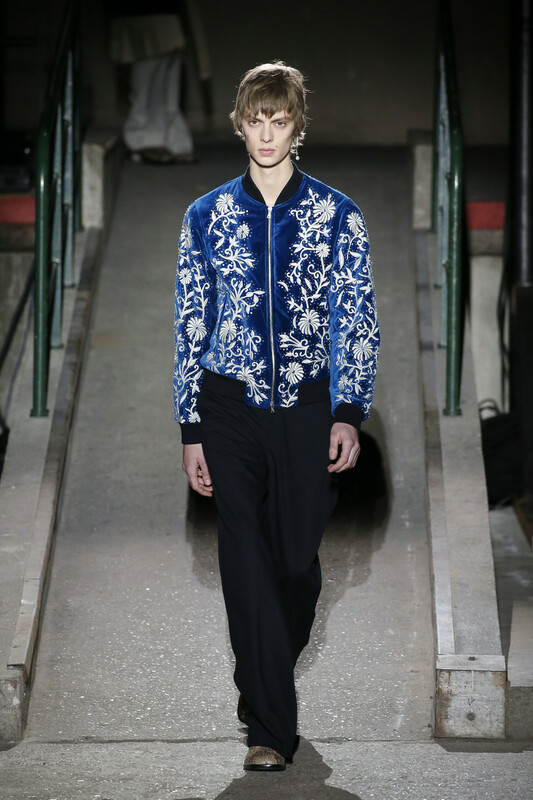 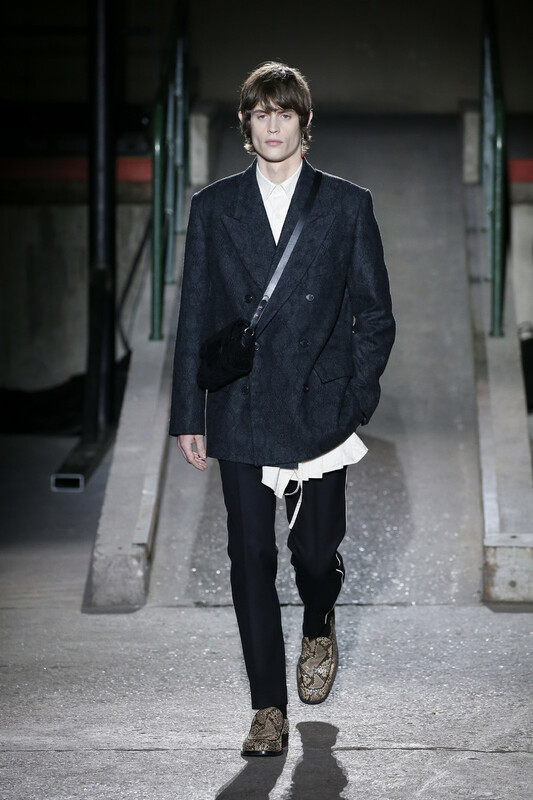 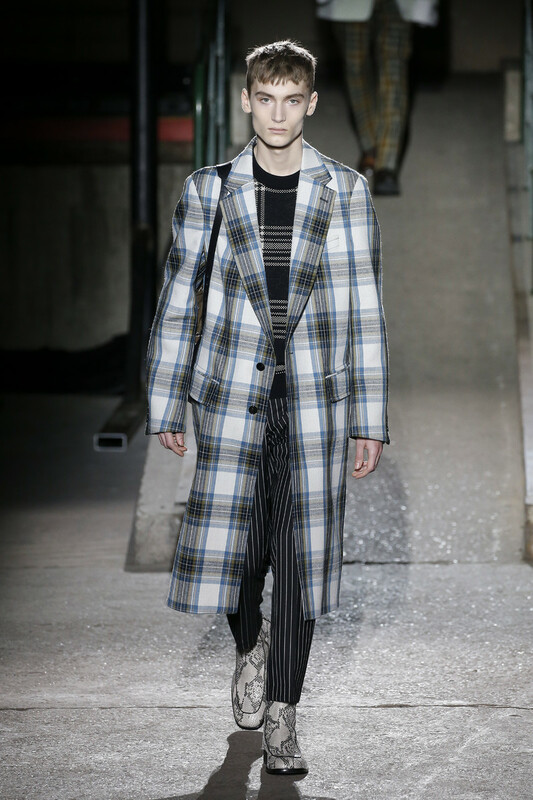 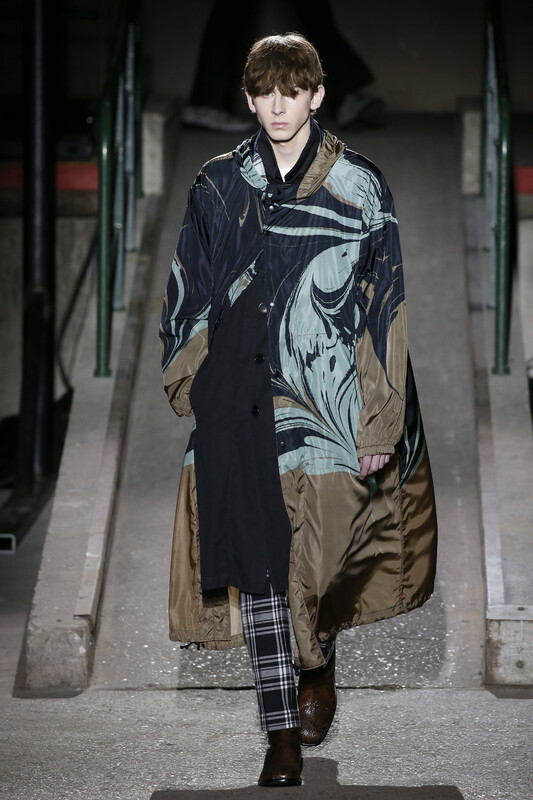 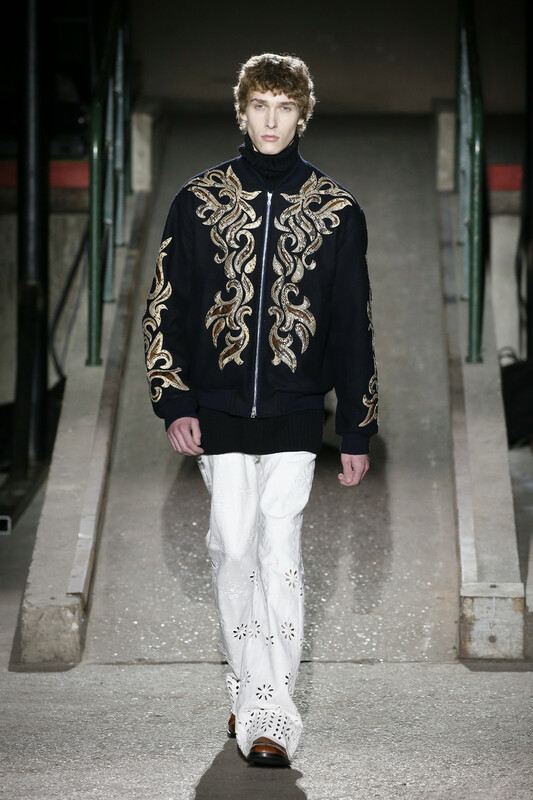 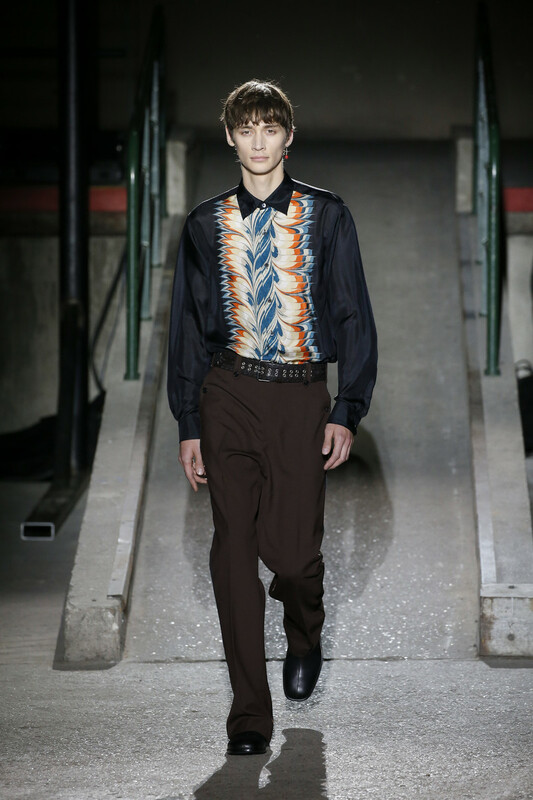 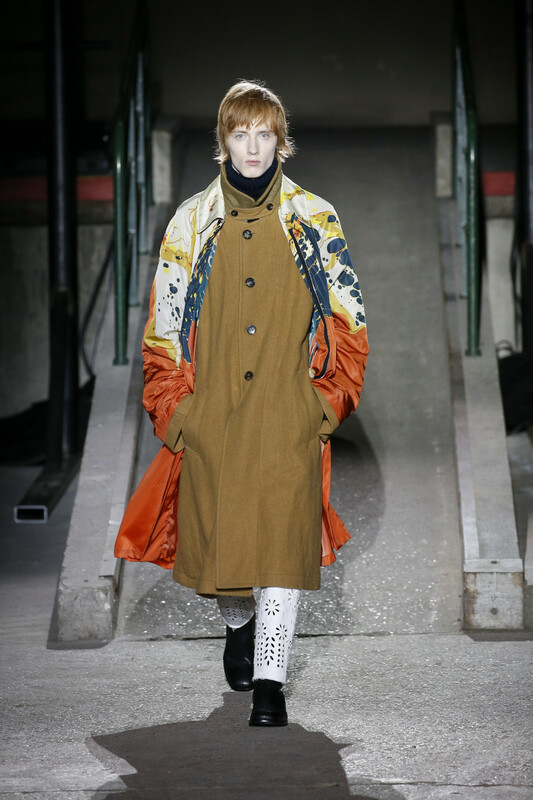 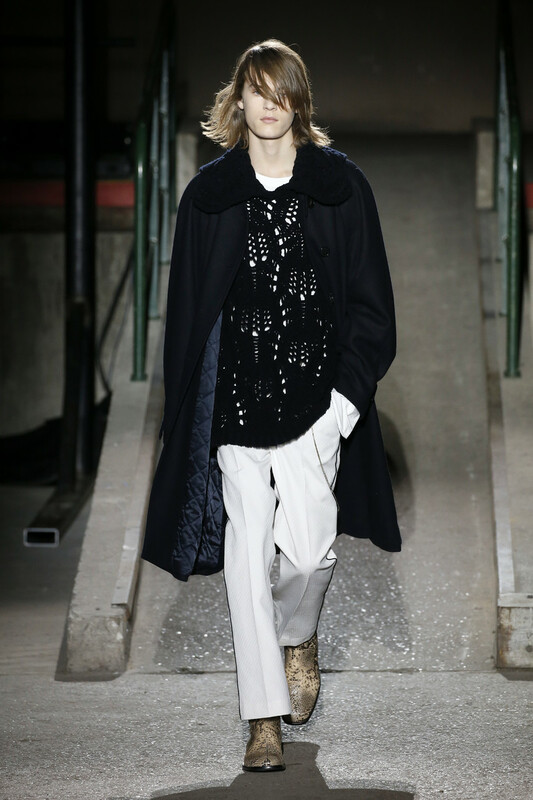 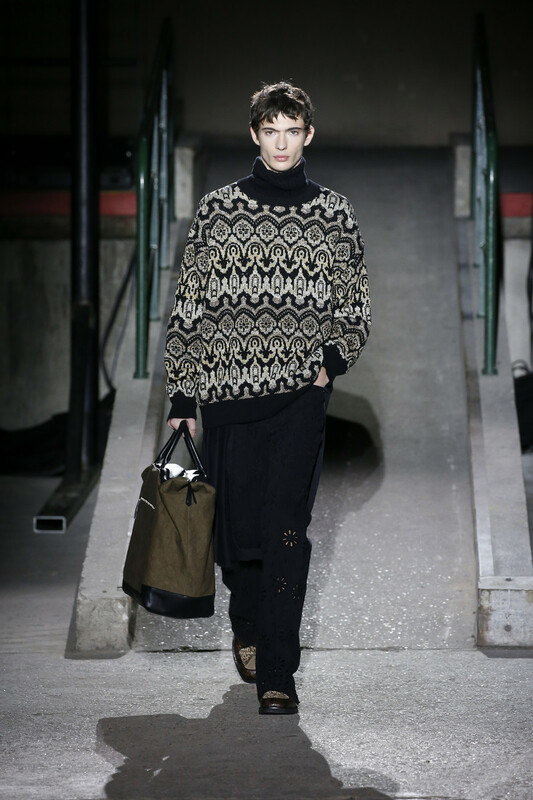 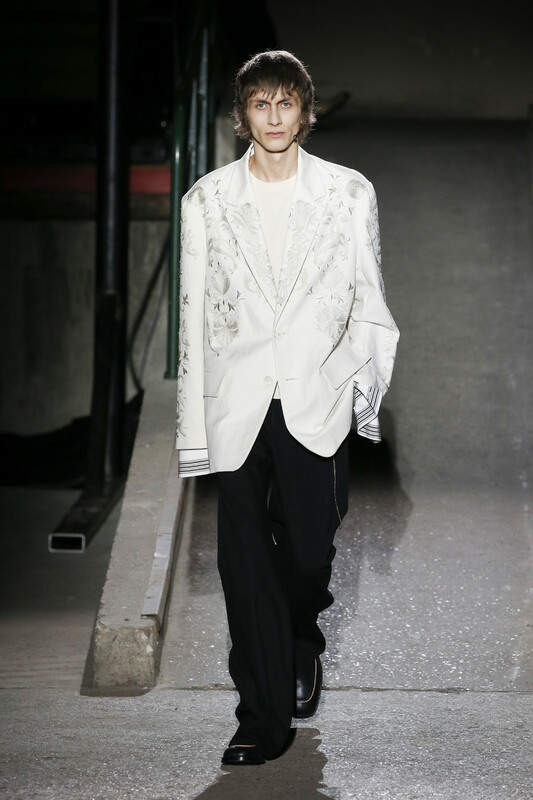 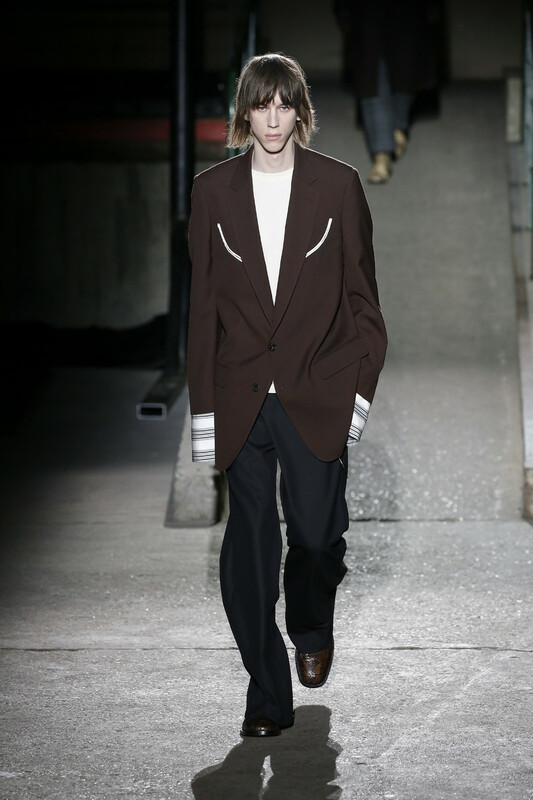 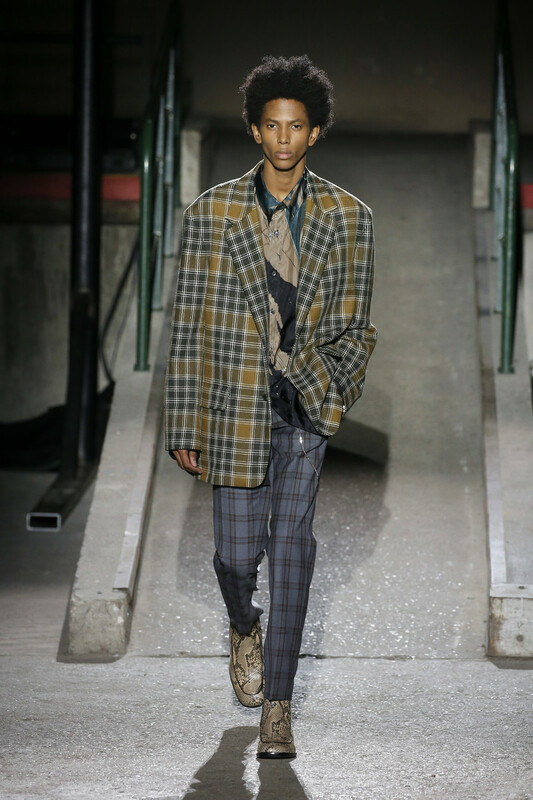 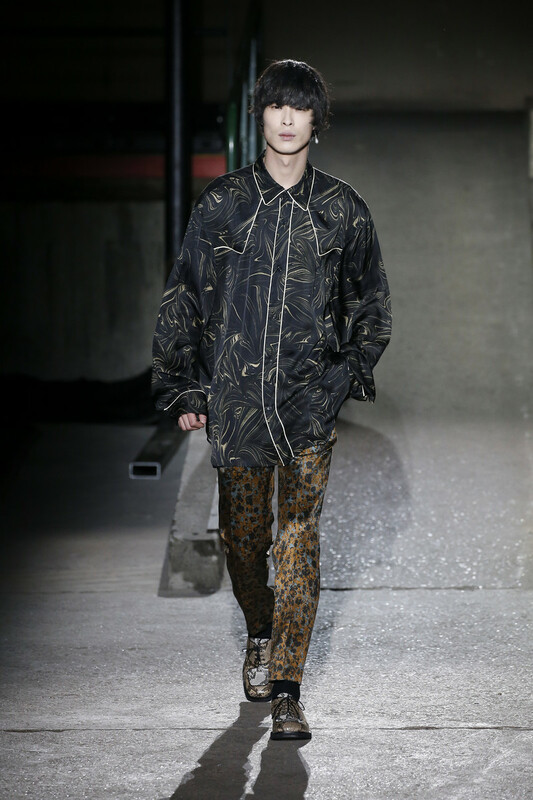 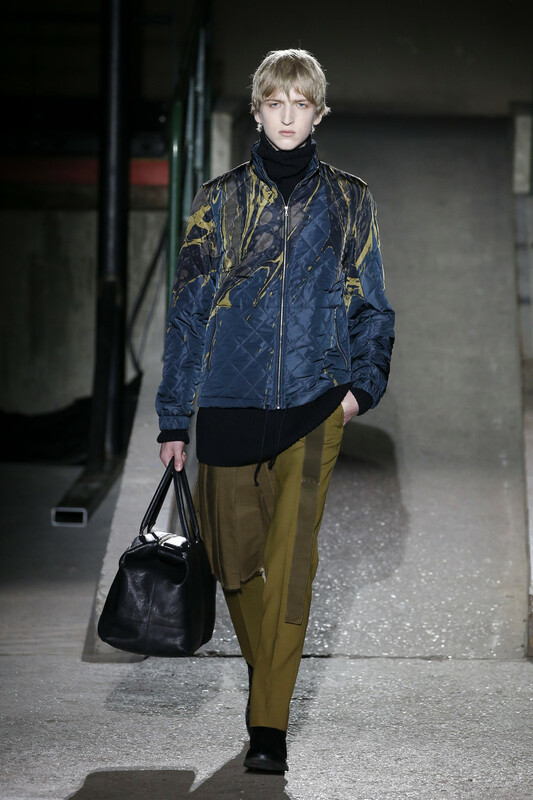 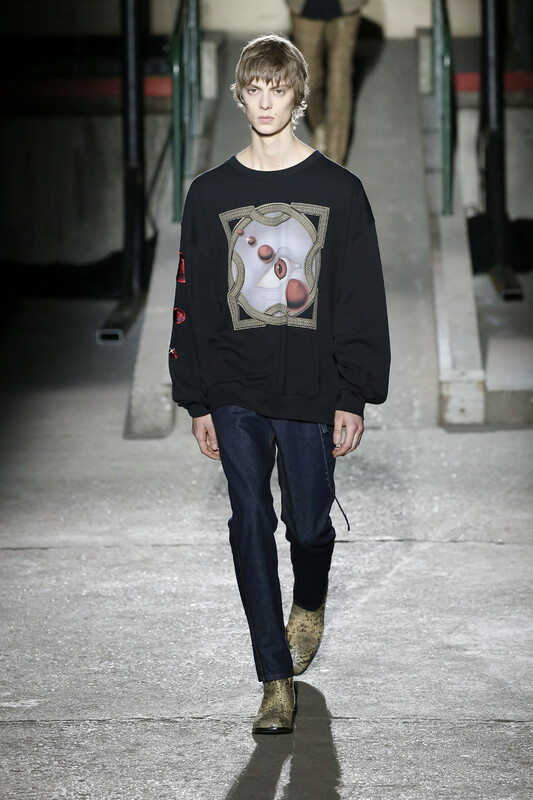 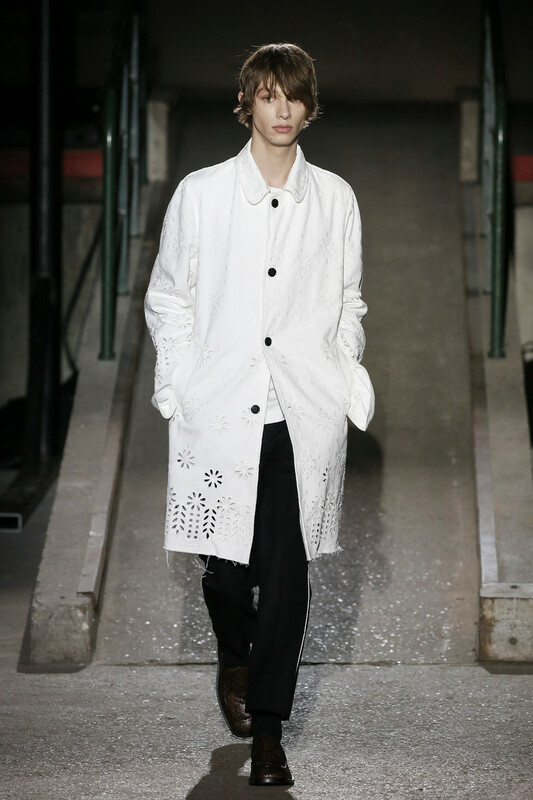 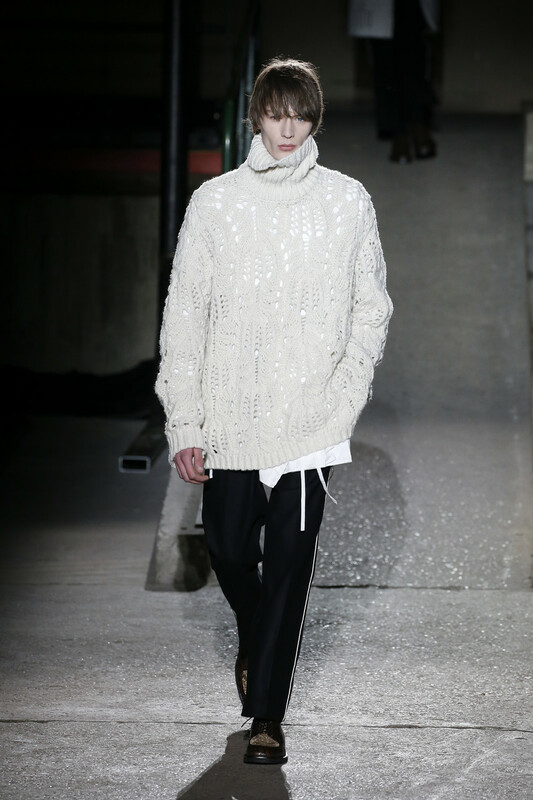 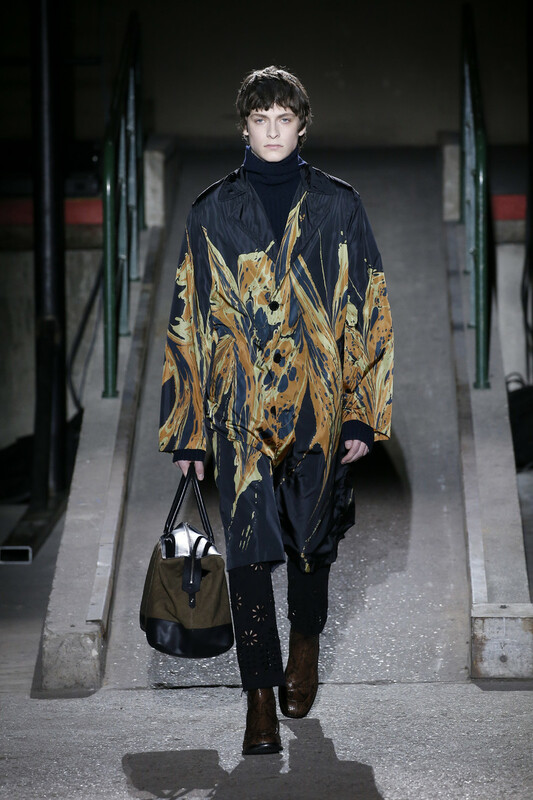 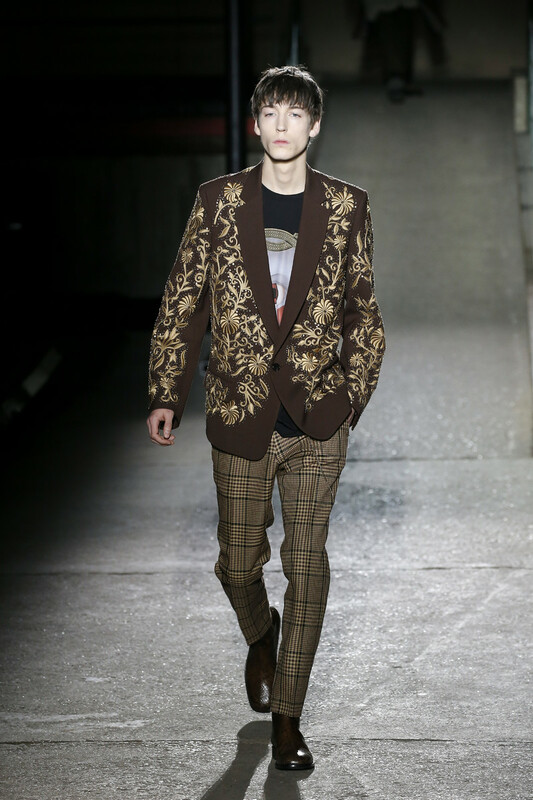 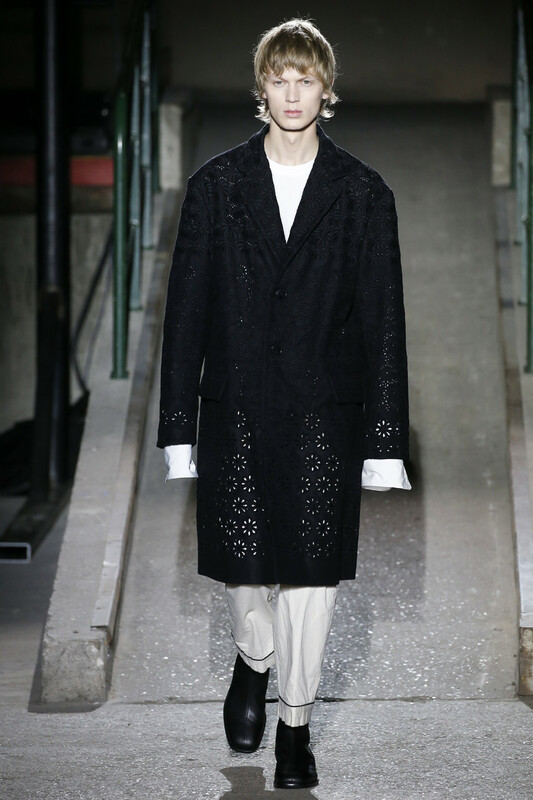 Van Noten continued to play with oversize proportions in the slouchy suits, boxy trenchcoats and the baggy pants. 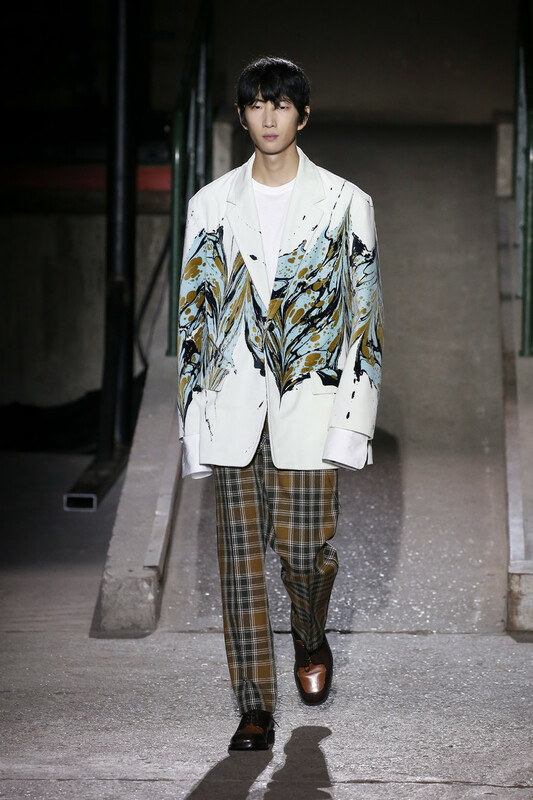 The designer’s magic colorist instincts climaxed in an Instagenic run of anoraks in swirling colored marble-y prints recalling Venetian paper or spun paint, with models gathering in a painterly formation for the finale. 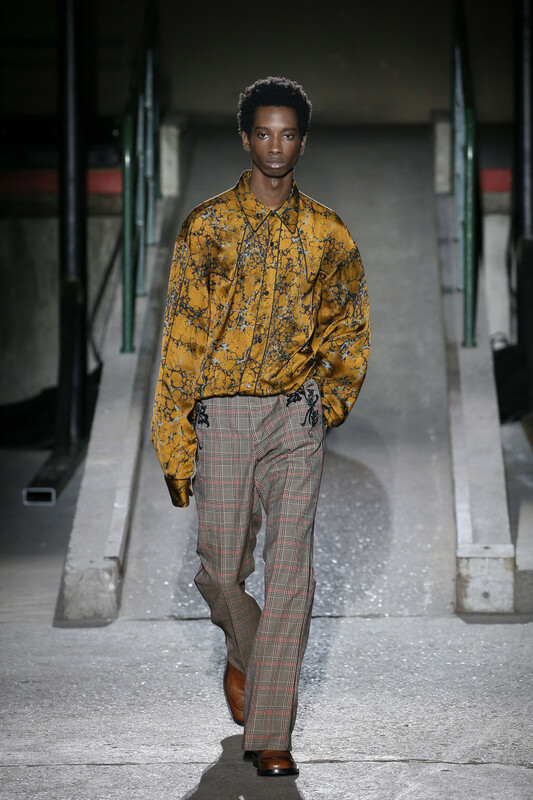 The open-border mixing of cultures worked best on a tropical print pajama shirt paired with a fantasy leopard print skinny pant and snakeskin shoes which, like the rest of the collection, was chic whilst telegraphing rebel instincts.